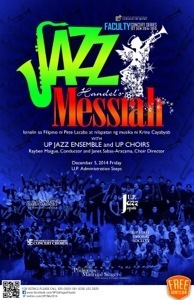 The University of the Philippines (UP) College of Music ends its faculty concert series, First Semester of Academic Year 2014-2015, with a jazz arrangement of beloved Handel’s Messiah done by Krina Cayabyab, with translation in Tagalog by famed poet laureate of the Philippines, Pete Lacaba. The concert will be done on 5 December 2015, 6:30 PM on the steps facing the amphitheater beside Quezon Hall–the administrative center of UP Diliman–as a way of celebrating the last day of classes in the said campus and ushering in the festive Christmas season. The first of its kind in the history of Philippine music, Jazz Messiah in Tagalog, innovates tradition with a view to futurity in which world local cultures combine in a spirit of cosmopolitanism. The event will feature Prof. Rayben Maigue’s well-known UP Jazz Band accompanying the famous choirs of UP Diliman such as Philippine Madrigal Singers (Mark Carpio, director), UP Concert Chorus (Jai Sabas-Aracama, who is the main choirmaster of the event), UP Singing Ambassadors (Ed Manguiat, conductor), and UP Staff Chorale (Chris Reyes, director). Each of these choirs will render two Christmas songs in the first part of the show, which is free to the public. Translating this musical masterpiece by Handel, which comes from mid-18th century into 21st century popular music and language comes as a way of paying homage to art as well as destabilizing the myth of authenticity that has generated many inter-ethnic conflicts around the world. By situating an expression that sits comfortably both *inside and outside cultural-linguistic particularities,* the College and the university hope to convey a message that beyond cultural borders, a heterogenous social world harmony is achievable if alternative voices–jazz and Tagalog–are heard in the global ecumene. The evolution of music for a million years has witnessed how music has been one of the most potent symbols in human behavior that has been fostering solidarities that are necessary for human adaptation and survival.